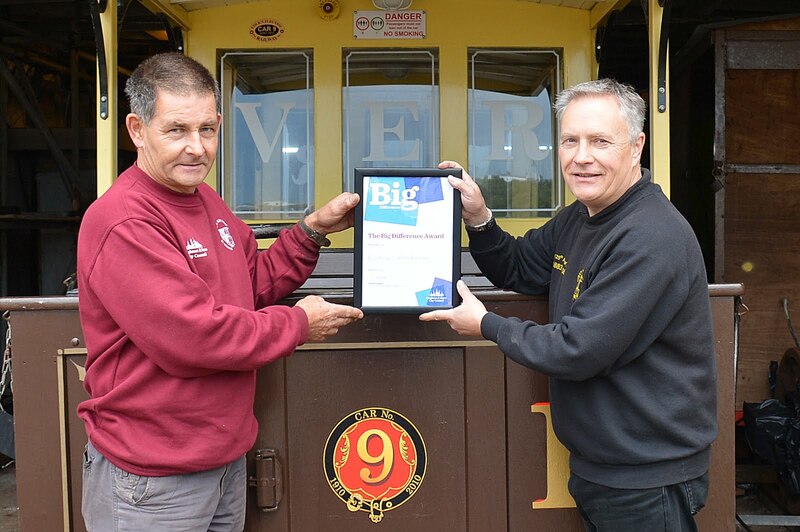 Our photograph here shows Stuart Strong, Manager of Volks Electric Railway presenting Assistant Manager Barry Fuller, with ‘The Big Difference Award’ from Brighton City Council. The award is presented to individuals who are acknowledged as having made particularly significant contributions in their particular field. Well done, Barry! My grandmother’s family had very strong links with Volk’s Railway. Her father, James Barker, was chief engineer in the early 1900s, and her brother Thomas was a driver at around the same time. In fact, he was driving when a little boy was killed on the line in 1912. I have copies of the inquest documents which include statements by Magnus Volk himself. It was a tragic accident, and my great-uncle was cleared of blame, but it was very sad nonetheless. Correction to my post above! I meant to say Henry Barker (the driver).